Home Headlines Conan Core Book, Player’s Guide & Jeweled Thrones Launch in Print, by Crom! Conan Core Book, Player’s Guide & Jeweled Thrones Launch in Print, by Crom! Today we’re pleased to announce new items in our Conan Collection are now finally available for barbarians who wish to know the secrets of the riddle of print and demand physical products for their adventures! Unfortunately due to the sorcerous machinations of Thulsa Doom these were launched prematurely last month, and had to be withdrawn, but now Kickstarter backers and retailers have got their copies, Conan is ready to roar in these bold Hyborian age adventures! Also available is the Conan Core Book CONQUEROR’S LIMITED EDITION. Durable and elegant, like your grandmother’s Bible or your father’s sword this is a Deluxe Limited Print Run soft leather bound ‘softback’ collector’s edition marked with the Phoenix on the Sword design pressed in to the leather, with gold-edged paper and reading ribbon! 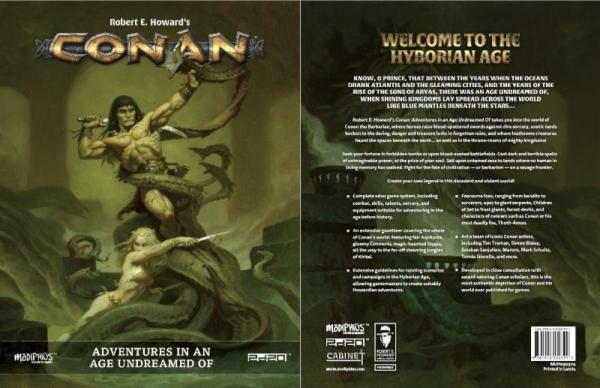 Create your own legend in the time before history with the Conan Player’s Guide now in print for non-Kickstater backers, an invaluable resource brave adventurers in the savage worlds of the Hyborian Age. Within these covers you’ll find all the information you need to create a wide range of characters, whether heroic barbarians, bold rogues, seasoned mercenaries, wise priests, stealthy archers, hardy nomads, or more! Know oh prince, though, that the Conan Player’s Guide is aimed at firmly at players of the game and contains content drawn entirely from the Conan Roleplaying game core book. If you own the core book, you don’t need to purchase it. GMs may wish to let their players and RPG groups know it is available though! Also now available in print is the first set of Conan adventures Jeweled Thrones of the Earth which presents seven complete and ready-to-play adventures forRobert E. Howard’s Conan: Adventures in an Age Undreamed Of. 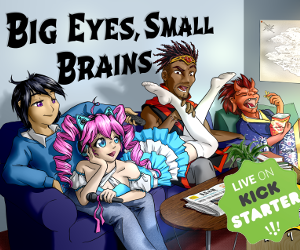 Within these pages gamemasters will find the means to take heroes across the whole of Conan’s world. Explore a lost city in the steaming jungles of the south and dare to face the Feathered Ape, as well as other menaces inDevils Among Green Stars. Sail across the eons to an island enthralled by a demon-goddess, and attempt to escape the hand of fate inThe Pact of Xiabalba. Seek unimaginable wealth within TheCaves of the Dero, whose denizens harbor a terrifying secret. Defend the frontier against an attack by Picts, spurred to war by an ancient evil known only asThe Ghost of Thunder River. Discover the secrets of a sinister thief-cult hidden within the heart of a city, watched over byThe Thousand Eyes of Aumag-Bel. Written using Modiphius’ 2d20 system, these ready-to-use adventures for include new monsters and foes suitable for anyConangame: ranging from horrific crawlers, giant-king skeleton warriors, the Worm Within, cave horrors, the monstrous Watcher, the mightya’ghama, and the degenerate saurian descendants of the ancient serpent-folk. Also available is this fine Conan Player’s Dice set, plus individual dice for your game. The Conan Player’s Dice set is an essential dice set for the Conan Adventures in an Age Undreamed of Roleplaying game. Roll the bones for your life by Crom! with this attractive set of dice which consists of: 2x Conan D20 Phoenix Dice, 1x Conan Hit location dice and 4x Combat Dice. We also have single d20 Conan: Hit Location Dice and single d20 Phoenix Dice, featuring the phoenix on the sword motif, for sale. We hope you enjoy this first wave of Conan print releases and look out for more great Conan products appearing soon, including print editions of supplements like Conan The Thief and Conan the Mercenary, plus you can also give the game a try for yourself in our FREE RPG Day Quickstart, The Pit of Kotallu. ++Stop Press++ We’ve just received word that fresh copies of the acclaimed Tales from the Loop core book, will be back in stock this week, and with Stranger Things Season 2 starting on Friday, they couldn’t have come at a better time! Keep an eye on Modphius.net and our social media channels for a further update!